Crochet is a process of creating fabric by making patterns with yarn or thread. In crochet, loops of yarn are pulled through other loops to make a fabric. Crochet is done with a crotchet hook using a single active thread loop. I find that this process produces a comfortable material that can be shaped and used for a variety of items. What kind of yarn is used in the hats/blankets? 100% high quality acrylic yarn. Why buy a Crochet Hat for my baby? When babies are born, they are moving from a warm environment to one where the use of air conditioning is common. Use of hats at this time is normal indoors. When taking a baby outside realize the baby is much more sensitive to temperature than you are, especially in evenings and during cooler months. The first 2 years of a child’s life are filled with photo opportunities and beautiful, colorful Crochet hats make perfect photo props. 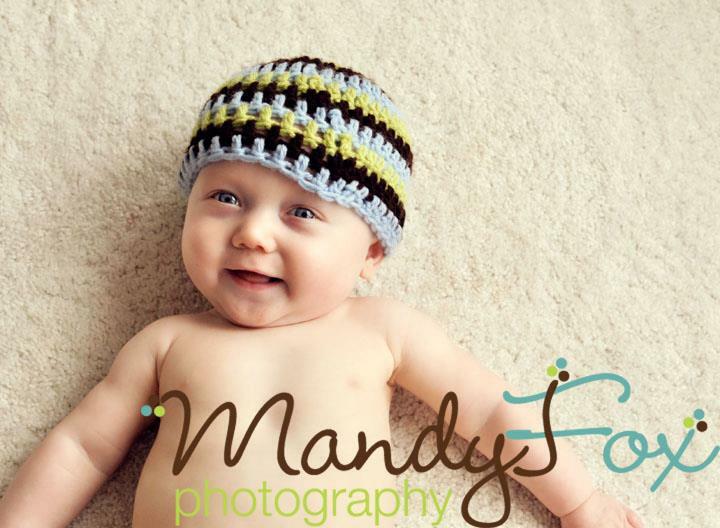 Whether adorned in a favorite team’s colors or to match an outfit, Crochet hats create an adorable look for the baby. Parents take sincere pride in these photos as they are often displayed and given to loved ones. Baby and child crochet hats also make wonderful heirloom keepsakes, cherished for years to come. Many mothers will reminisce while holding the hats, still able to smell their precious children in the material. MirandaGirlDesigns hats are high quality and will be treasured by parents well into the future. What makes a MirandaGirlDesigns Crochet hat different from a generic one? The hats I sell are custom and handmade by me. They come from a smoke-free home, using high quality materials. They are not mass produced and shipped from China or another third world country. They are made to order in the specific colors and sizes requested. They can be made to match a desired look or color scheme. They make great gifts for babies, kids, and adults. They are made to last with proper care. What colors and styles do the Crochet hats come in? The Crochet hats can be made to match a desired look or color scheme. They come in three options: single, dual, or three color. They can be made in a favorite team’s colors or to fit a theme. When ordering, please make sure to describe the desired look so the hat can be made to match. Please measure the circumference of the head of the wearer all the way around, from around the back of the head at the base of the neck, to the front of the forehead. You can use a tape measure or a string/ribbon. If the Crochet hat is intended as a gift, the size on the order form works just fine. I have not had a hat returned for not fitting properly. How do I care for the beautiful Crochet hat? Machine wash in cold water. Tumble dry on low or lie flat to dry. The Crochet hats are made with tremendous care using high quality materials. They are shipped carefully to ensure they arrive in perfect condition. If there is any problem with the product or the item arrives damaged, the item will be replaced, no questions asked. After almost 2,000 orders, I have not had one hat returned or not arrive at the destination. Please check out my reviews. When will my hat be shipped? The Crochet hats are made to order and ship in 1-7 days. A hat ordered directly from existing inventory in my Etsy shop will ship quicker than custom orders. If an order is needed under a different time schedule, please email me at miranda@mirandagirldesigns.com so I can accommodate. If you see the color/style you want in my Etsy Shop, you can order directly from there. For custom orders please fill out the order form. I will email you within 24 hours to confirm size, color, and style and to arrange payment. Payment can be made via paypal. Items will not ship until payment is received. I look forward to your order and creating a beautiful Crochet hat for you or your loved one. Yes, since 2007 I have had the privilege of receiving orders from friends and family of previous customers. If you know a family that is expecting a baby or is getting ready to do their family photos, please let them know about me and my great work. You can email me at miranda@mirandagirldesigns.com or you can have them visit http://www.MirandaGirlDesigns.com I look forward to earning their trust and business.